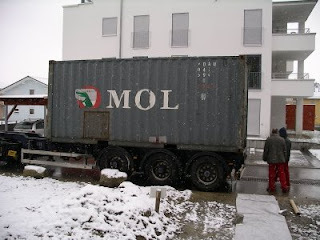 One year ago on a cold Wednesday morning "our" container arrived and we moved in our new passive house. This was after a 7 week journey by truck and train from San Jose, CA, to Houston, TX, then on with the Sealand Motivator to Bremerhaven, Germany, by train to the Ulm (Germany) container terminal and on by truck to Friedrichshafen. Our kids enjoyed having their toys back and all of us, after 7 weeks in hotels and with relatives, to sleep in our own beds again.